When you’re a spontaneous person just as I am, then it generally doesn’t get you flustered if a friend asks you to grab your handbag and swiftly head out to a (spur-of-the-moment) gig or art show. Some time ago, this is exactly what happened. It was an occasion to remember—I had enough energy to dance the night away, my body did not feel bushed by lack of sleep, and I finished a work project far earlier than expected. The “i’s” were dotted, and the "t's" were crossed! And, these rather winning types of moments during the week called for an unprompted happy hour of almost anything worthy of a favourite lipstick reapplication! 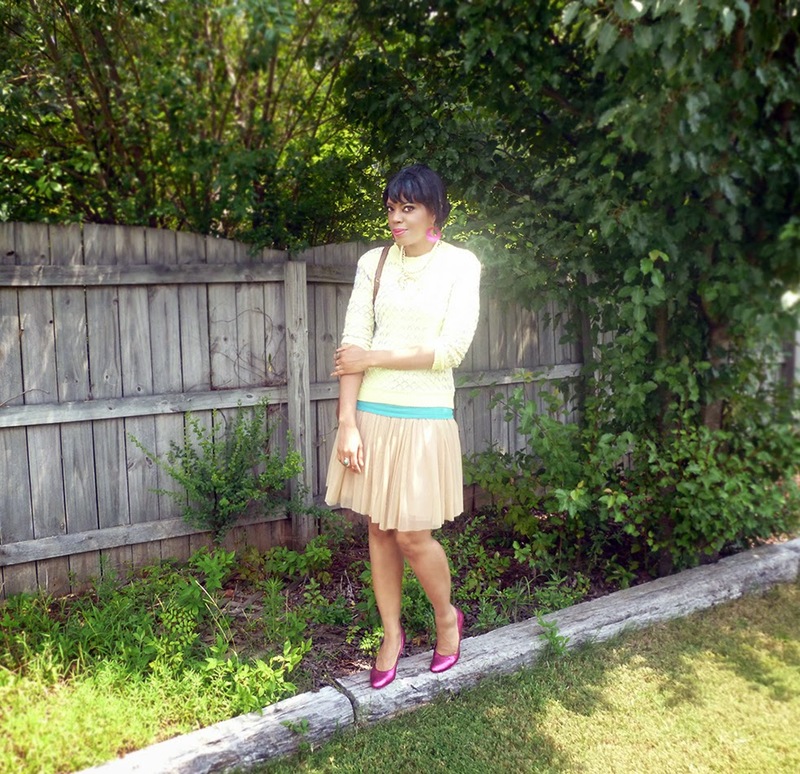 Even though I had plenty of things to wear, I wasn’t up to completely changing my clothes, so I brought out the pastels. Have you experienced this feeling, when you could really think about your outfit, but you really don’t want to think about your outfit? Of course, you have! Since I had no time to waste, I kept the tulle skirt and shoes that I wore earlier in the day, and swapped my blazer and blouse for a teal tank paired with a pastel pullover. I needed accessories and wore a statement necklace. Although, at first I had on a seafoam-beaded necklace, I switched to this ivory fashion piece. I did buy a couple of art pieces, which I will likely show at a later date. This outfit was fine for the event, because I was determined that it was going to be just that … fine! There was no need to second-guess myself, and no time for messing about. So, I confidently dressed partly summer and mildly autumn, which worked since a cool summer night breeze graced us with its presence. Sometimes, spontaneity is all you need to keep your style versatile and sharp! What is the last thing that you did spontaneously? The goods: Vintage camera bag-Hinson, Beaded Necklace, Pastel stitch jumper, and Retro-style sunglasses-c/o Oasap, Glitter heels-DIY, Tank-H&M, Tulle skirt-F21. Ich liebe deinen Tüll rock Madison und die Schuhe erst! Wouwwwww!!! Of course i have!! I like the way you have thrown this outfit together, the tulle skirt is gorgeous! so well put together! sometimes the best thing we do are the ones we do without things. Being spontaneous is often my way (or my choice) because when I plan things never work out...I've learned to just go with the flow sometimes. You look super cute and very stylish! love the heels, the vintage bag and the pink earrings...perfect accessories for that lovely yellow sweater and that adorable tulle skirt! Hi Madison, wow you look so glamorous. I love the cute tulle skirt and the way you styled it. I would take me hours to think of a look like that. I have to admit I'm not a spontaneous person. So I can't even remember one thing I did spontaneously. Have a happy Tuesday!! Lovely look, I adore this necklace! That Pastel Stitch Jumper is divine!! Da ich oft an Zeitmangel leide, plane ich lieber im Voraus. Aber gerne bin ich auch mal spontan. Es kommt auch darauf anm um was es geht. oh, what a gorgeous look. Those shoes are amazing, what a color. I'm usually the sort who doesn't really like to think about my outfit which is why I have a number of fail safe looks. You look amazing as always Madison! Loving your jumper and glittery heels. 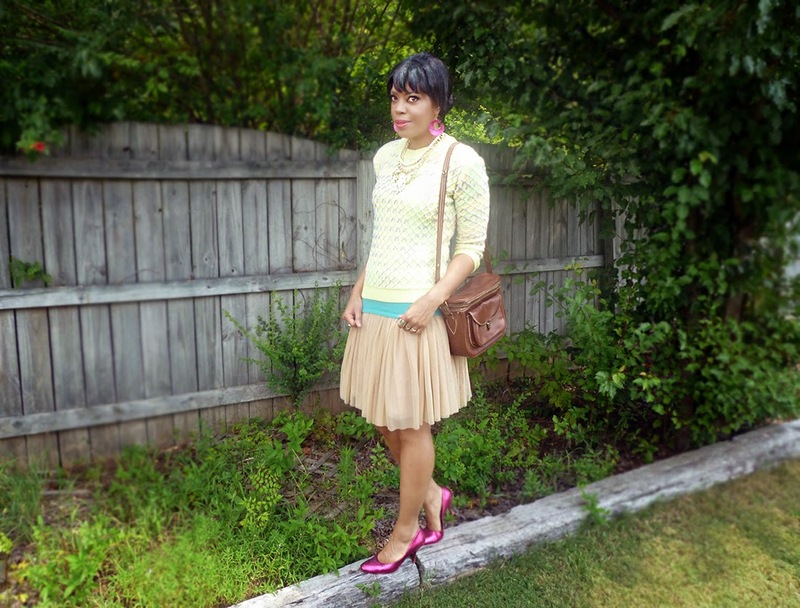 Loving the pastels and the color combos are so pretty, the vintage jumper is very cute. I, too, have those feeling sometimes even though you've plenty in the closet and those packaged you just ordered and came right in front your door, don't even excited to open:). Wish you a lovely day and week:). I love pastels more and more. You look really great in this outfit; it really goes with your look. Oh loving the soft matching tone on tone pastel palette. Very nice. Gosh I have not been dancing in forever! can't answer your question, oops :P but I love pastels, they just automatically create a positive, happy vibe and make an outfit look pretty. your sweater is lovely, I like it how it includes different shades in it. and it goes beautifully with the necklace. Always enjoy a pastel look. And those retro sunnies--to die! Kudos to you for being so spontaneous. I'm not as good at that. The last spontaneous thing I did...no idea, lol. It happens every blue moon to all of us, I'm sure. Thanks for your comment. Ha! :-) you're so funny. Thanks for your comment Emmy. Very beautiful. I seriously need your shoes in my life, they are perfect! I love this outfit, the color of the shoes is perfect! Thanks so much Mira! Hope you''re enjoying the week. You look amazing. I love yellow. I really like how you combined the skirt with your jumper! Nice look, i love being spontaneous, but now with two littles ones everything must be plan in detail, a haha, you look great!! You did a great job with this outfit, I think it works great for some happy celebration after getting a job well done. I really love the pastel colors!